On this occasion Templates boy will discuss Some White Hat SEO Techniques and Black Hat SEO what you can apply as a consideration for future blogs. White hat SEO is a good and true SEO optimization effort and does not violate the TOS that has been set by search engines. For all bloggers who want to get good results on the SERP page it is recommended to apply this one SEO technique. The main goal of White hat SEO is to increase the page rank of the blog to page one on the search engine. Indeed, this technique takes a long time, but it is safer and you can trust the Search Engine. Isn't it fun if your blog or site is often visited by Search Engines? In addition, visitors to your blog will be crowded and stable if you manage to optimize a page on the Search Engine. The technique used by a White hat SEO is very simple as long as it is diligent and has the desire to update posts every day (not like this blog). Arranging words or writing on blogs is not as easy as you imagine, but search engines are very happy with original content. Improve the quality of blogs by always presenting quality and original content. Perform a variety of correct keyword optimization without color or font size manipulation with keyword density of one content that is not more than 3.5% or 5%. Does not make certain url redirects to another page when a visitor opens the link and of course strengthens SEO optimization by entering the blog keyword into the url. Doing the right link building and not getting out of the way like building link building naturally and not by buying quality backlinks from blogs that have high pagerank. In choosing a template or display also includes one White hat seo technique that can be done, so choose an SEO friendly template and don't forget to set the CSS by streamlining it so that the loading of the blog becomes fast. A lightweight blog is very popular with search engines or search engines. Creating relevant content and showing relevant information too, the point is that if you want to market a product, market a sporty one that does not make other keywords inserted in the content so that visitors know the purpose and purpose of the blog with the appropriate product. Look for good backlinks from sites that have high PageRank or have a high PA (Page Authority) and DA (Domain Authority), submit also to dofollow site directories and look for backlinks that are one-way / according to your blog content. It is recommended to do Ping techniques regularly after publishing new posts. But don't Ping too often because it will be considered spam. If you make a lot of posts in a day, just do Ping once. Do it by relying on Facebook and Twitter or other social media, which need to be considered when linking must have a title that matches the discussion on the blog. 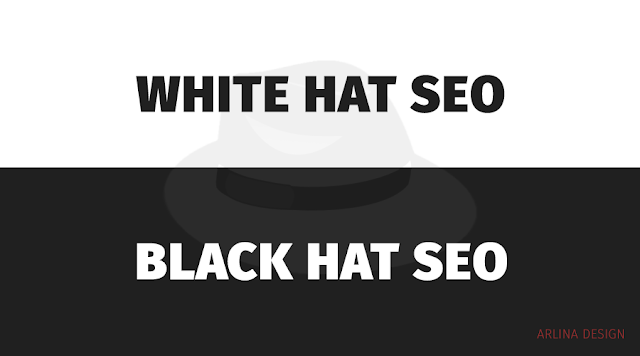 Black Hat SEO with a black hat logo mascot is a optimization technique for a blog to get the first position on search engines but by illegal / fraudulent means. Indeed, the effects of Black hat SEO can be seen very quickly but not a few blogs that are hit by Google Sandbox or even banned because of using this black hat technique. This technique tries to try to fool search engines. Can be used by using hidden text, filling keywords, fake pages, and others. Their goal is actually the same as White Hat SEO, which is to get first place in search engine results, but only in a short time. Therefore, Black Hat SEO is not a good technique to practice. If you run a business on a blog, I recommend not using this technique, because it will cause the site's ranking in search engines to drop dramatically. Link Farming is a technique of collecting links on one blog page or site. The point is that on one page only contains a list of links that can be very large up to hundreds or even thousands of links. Keyword stuffing is the application of excessive keywords, where a blog page contains a repetitive or unnatural word. Text Not Visible is a technique of hiding keywords in a blog whose words will not appear in plain view. The trick is to match the color of the text to the background of the template. for example if our template has a white background then make the color of the text white. The invisible text can be seen by blocking all pages by using ctrl + a to select all hidden posts. Another way is to pay attention to the page source of the page. Repeat title means the contents of the post only contain repetitions of the title. It's easy, just make a post, for example the title SEO Techniques then the contents are just a repetition of the title of the post that is SEO Techniques, There is no need to add another article, that's enough. Usually techniques like this apply to new keywords that are on google or just appeared on google. Comments on Techniques White Hat SEO and Black Hat SEO, hopefully add insight to blogger friends. thank you.